Cornell researchers and a global team of astronomers have uncovered the cosmological source of a sporadically repeating milliseconds-long “fast radio burst.” Once thinking these bursts had emanated from within the Milky Way galaxy, or from cosmic neighbors, the astronomers now confirm that they are long-distance flashes from across the universe – more than 3 billion light-years away. “These radio flashes must have enormous amounts of energy to be visible from over 3 billion light-years away,” said lead author Chatterjee. Other Cornell researchers on this paper, “Direct Localization of a Fast Radio Burst and Its Enigmatic Counterpart,” include James Cordes, the George Feldstein Professor of Astronomy; and Robert Wharton, doctoral student in astronomy. Fast radio bursts, or FRBs, were first seen about 10 years ago by Duncan Lorimer (watch video above). In November 2012, Cornell astronomers using the Arecibo Observatory captured its first FRB – which lasted three one-thousandths of a second. Laura Spitler, M.S. ’10, Ph.D. ’13, discovered it as a postdoctoral researcher sifting through radio telescope data. It was called FRB 121102. Until then, only the Parkes Radio Telescope in New South Wales, Australia, had discovered a handful of previously known FRBs. Rising just ahead of the winter constellation Orion, FRB 121102 – the one discovered at Arecibo – has a home in the pentagon-shaped constellation Auriga. “There’s a patch of the sky from which we’re getting this signal – and the patch of the sky is arc minutes in diameter. In that patch are hundreds of sources. Lots of stars, lots of galaxies, lots of stuff,” said Chatterjee. To locate the source of this sporadic flash, astronomers blended detective work with modern telescope technology, while combing through terabytes of data. The Arecibo radio telescope has a resolution of three arc minutes or about one-tenth of the moon’s diameter, but that is not precise enough to identify uniquely the source. Needing higher resolution to find it, the astronomers sought the help of the National Radio Astronomy Observatory’s Karl G. Jansky Very Large Array, near Socorro, New Mexico, which provided more than 80 hours of observation time. The radio telescope array – a collection of dishes aimed at the cosmos – allows for better than one arc-second resolution. After 50 fruitless hours of staring, the scientists hit the jackpot. “We caught the fast radio burst in the act,” said Chatterjee. The astronomers used a full range of telescopes to observe that sliver of sky, including NASA’s Chandra X-ray satellite, Chile’s Atacama Large Millimeter/submillimeter Array, and the Gemini optical telescope in Mauna Kea, Hawaii. “With the Gemini telescope, this optical blob looks like a faint, faint, faint galaxy – and this faint, fuzzy blob corresponds with, smack onto, the radio source,” Chatterjee said. Other telescopes around the world helped to plot the light spectrum. “It’s got a detectable signal of very particular colors of hydrogen, oxygen and other elements – but Doppler-shifted,” said Chatterjee, explaining that the shifting wavelengths denote cosmic expansion and provide clues for the source distance. A fast radio burst (FRB) that repeats, a phenomenon that can’t be explained by a one-off event. In late August, researchers reported that the repeating burst sent out 15 flashes in one hour. 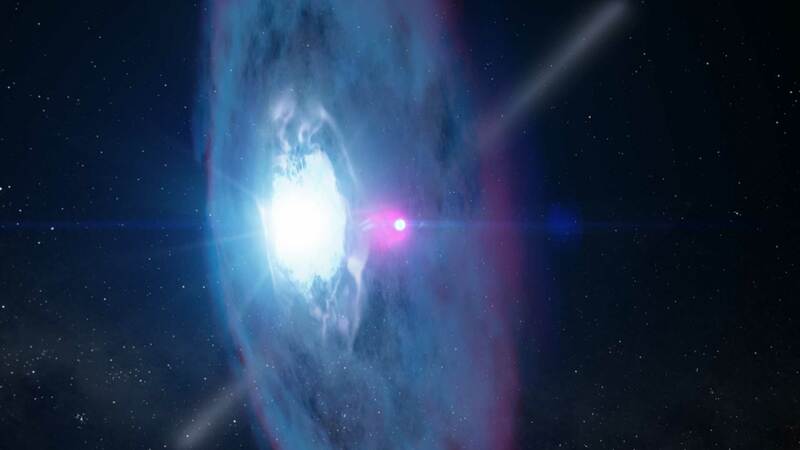 “It is possible that FRB sources are always active but appear to fluctuate greatly in the brightness of their bursts because of dynamic lensing,” Cordes said. Astronomers have seen similar activity in other situations, said Robert Main, an astronomer at the University of Toronto. “Several pulsars have now shown the effects of plasma lensing, which Jim proposes could be happening in FRBs."